It is with the twice constitutionally elected leader of the National Socialist German Workers Party, Adolf Hitler, that other builder and putative leader of a united, integrated corporatist fascist Europe, with whom Tony Blair has, personally, psychologically and politically the most in common. We will negotiate a withdrawal from the EEC which has drained our national resources and destroyed jobs. In this complete contradiction of principle in the ruthless search for power we see the classic fascist. 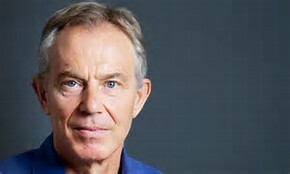 First Blair saw the Labour Party as his source of power, then the UK Government (abandoning the beliefs of the Northern working class who voted him in) then the European Superstate, then George W Bush and the Iraq war, then finally the tens of millions of Pounds he has “earned” from supranational political roles, corporate payments and his “Foundation”. The one consistent characteristic of this “servant of the people” has been his sole concern with his own political and financial promotion. I set out below a table of comparison between Hitler and Blair which must be taken as a whole. Any one element in the character of either could of course be shared by any number of politicians who would not or have not represented a grave danger to their electorates. But I submit that the number of such comparisons are deeply disturbing and explain much of what has happened and might have happened to the United Kingdom had not the people voted for freedom on 23rd June 2016. In true fascist style Blair now calls on “the people” to “rise up” against the democratic majority and overturn Brexit. Father an orphan and a Conservative. Split between Scottishness (Father) and Britishness (his personal power base). School activist, meddlesome. Exaggerated stories of his youthful adventures (flying alone abroad as a schoolboy!). Father illegitimate and a Conservative. Conflict between Austrian origins and Germany (his power base). Hyperactive — disappointed when other pupils would not carry on playing cowboys and Indians! Unpopular at school but good at disguising the fact from those who matter (Headmaster thought he was popular) Resentful of authority but sought favour from his headmasters. “New Labour” – combined flag waving pseudo nationalism with pseudo socialism and big business corporatism – a “third way” “Blairite Party”. Joined German Labour Party, then pushed through abandonment of nationalisation of industry. Nazi (National Socialist German Workers Party) referred to as “the Hitler Party”. Used party to get power then marginalized party and concentrated on apparatus of State and corporate power. Contempt for Parliament – worst voting record in Commons. Committed troops to Yugoslav war by Royal Prerogative. Parliament later admitted its illegality. Used attack on Yugoslavia to boost profile at home and among EU leaders. Democratically unapproved steps towards integration, the Euro etc. Corporate greed will do much of his political work for him (eg Euro). Courted big business, received big donations for Labour Party from multinationals, recruited senior executives of BP, Northern Foods, Sainsbury’s, Barclays into government. Ford BMW and General Electric contributed to election fund Used NSDAP to get power then ignored party and ran a State apparatus under the “Fuhrerprinzip” – leadership principle. Enabling Act (March 1933) gave Hitler powers to rule by non-parliamentary order. Used military adventures (1935 March into Rhineland, attack on Czechoslovakia etc) to boost popularity. Ruled by decree. Hitler awarded Henry Ford highest civilian order in 1938. General Motors described by the US Ambassador in Berlin as “a war danger” for their aid to German industry. So convinced of his fundamentally just and compassionate destiny that the end of nation, parliament, democracy in creating a “superpower” and people power (constant references to “the people”) It is in the national interest to abolish the nation. Nazis gradually intimidated and took over opposition press. Hitler saw himself as designer, an architect. He needed to re-design and rebuild cities. Saw his architectural sketches as his “most valuable possessions”. Hitler’s glory was not in the nation but in the Reich (German European Empire) – like Blair’s Euro-state. Nation, Parliament, democracy gave way to the Reich, the State, the “People” (“People’s Court”, the “People’s Car” etc). Blair also promoted the term “People’s” this and “People’s” that. Hitler (like the Kaiser) used the State to promote big business. Great opportunities in the new Reich. Business (e.g. I G Farben) financed State intelligence activities abroad. Used “humanitarian aid” excuse to invade Czechoslovakia. (declared illegal at Nuremberg trials). It is difficult to apply the words national socialist and fascist to politicians without seemingly accusing them of inherent evil. But that is not my intention. I am not saying that either Hitler or Blair were inherently evil, they merely pursued certain grand ideas based on socialism, corporatist capital, Statism, an integrated European superpower and a managerial pseudo elite working independently of the parties which brought them to power. The kind of crushing manipulative state which they both created served the “big players” with “big ideas” needing “big structures”. Neither Hitler nor Blair were evil. But the former did evil and the latter has adopted an astonishingly large number of the former’s ideas, the most significant of which was to abolish 28 constitutions, 28 democratic sovereignties and sovereign currencies to absorb them all, including the United Kingdom, into the new German Europe. For “Europe” is the embodiment of the historical ambitions of German imperialism and continental fascism, whose principal aim has been to counter and defeat that very system of Anglo-Saxon liberal trade and parliamentary democracy based on the common law which Blair claimed opportunistically to love. The result has been mass unemployment, attacks on democracy by imposing EU Commissars to run countries, the revival of Nazi puppet states in order to break up Czechoslovakia and Yugoslavia, the political and financial subsidy of supranational corporations, the collapse of health and social care systems, mass migrations of young people faced with up to 60% rates of unemployment, an invasion by Islamofascism, the growth of (even official) antisemitism and a new European exodus of Jews. No one who has read my books Europe’s Full Circle (1997) Fascist Europe Rising (2001) or And into the Fire (2013) or seen the German inspired invasion of Ukraine 75 years after Hitler’s “Operation Barbarossa” will doubt the return of the evil days of the 1930s and 1940s – nor the role played in this disaster by the fascist figure of Tony Blair. MOST OF THIS ARTICLE IS AN EXTRACT FROM CHAPTER 4 OF FASCIST EUROPE RISING (2001) WHICH IS AVAILABLE AS AN EBOOK ON AMAZON OR A PHYSICAL BOOK FOR £15.00 BY EMAILING FREENATIONS.